Our Prunus Gyoiko is a small to medium upright Japanese flowering cherry tree that is ideal for anyone wanting to spend money with us. When we say medium, we don't mean communicates with the dead although we have no evidence to disprove this so it may actually do that. The tree warranty does not cover you failing to get a dial tone from our Gyoiko to long passed loved ones. 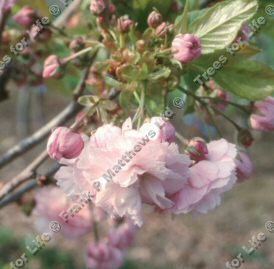 The mature shape looks similar to many other flowering cherry trees in that looks like a conventional vase, narrow at the bottom and then spreading out towards the top. The Gyoiko is a little unusual in that the flowers can have green and pink tinges to them amongst the very showy semi-double creamy white blossom. Expect these to make a show around May although local conditions may change that in either direction. If you are ordering for the North Pole Gardening Appreciation society, we predict poor results. The young light Bronze leaves add a little contrast to make the Gyoiko flowers stand out even more. Expect the tree to be around 6 metres at 10 years as this marks the end of its juvenile period. Typical end of juvenile period behaviour usually involves shouting and slamming doors. Should your Gyoiko exhibit any of these behaviours, we suggest calling a therapist before our warranty claim line. It could grow taller depending on local conditions and weather but your pruning kit will keep it to whatever height you prefer. Considered to be chalk and clay tolerant so you can attend pottery and art classes with it if you prefer. When it comes to pruning the Gyoiko, an occasional and light thinning is best. Gyoiko is supplied at a height of between 150-200cm in a 7-12 L pot for year round planting and better results than from either bare-root or rootballed stock.